Some or all users use the same Windows user account for authentication in the network. In this case, all print jobs will refer to the same user name. To avoid the inconvenience and get detailed statistics on each user, use printing accounts. When printing any document, the user will have to specify a printing account for that print job. Oftentimes, you need to collect printing statistics not only on users, but also on projects they work on. If that is the case, you can create a printing account for each project, which will let you collect project printing history by print jobs of that printing account. To create a new printing account or manage existing ones, select User → Accounts in the menu. You can disable any printing account. If you do that, you will be able to view statistics of that printing account, but won’t be able to select the disabled account when new print jobs are created. 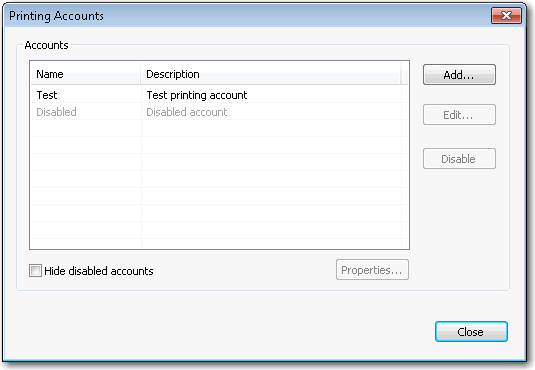 To use a printing account, create the “Redirected to account” printing action for the printer, user, or user group. You can do it via the object’s right-click menu Properties → Printing actions → Redirect to account. For displaying notifications on redirecting print jobs or selecting a printing account, O&K Print Watch Authentication Client must be installed on the user’s computer. 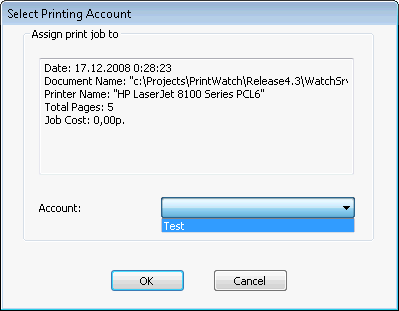 A user trying to print a document will be prompted to select a printing account for that print job. For any printing account, you can set quotas and printing actions. For example, to redirect a print job to a specific account only upon entering a password or PIN code, set the PIN code action for that printing account: The user will be prompted to enter a password after selecting a printing account. You can view statistics on printing accounts just like statistics on any other objects, just select Accounts in the tree on the left side.